As we entered the fifth floor of the new-ish Whitney Museum in the Meatpacking District, rows of foam cubes individually wrapped with quilted silver foil formed the show seating, which Jack McCollough and Lazaro Hernandez of Proenza Schouler had managed to procure just as the Frank Stella exhibition had come down. The contrast of textures in these exacting metallic cushions would later echo in a collection that felt like a natural continuity from their last two collections. In this monumental space dedicated to the best of American art, McCollough and Hernandez picked out another key American art epoch to inspire their collection, namely the process art movement of the 60s and 70s, looking at artists like Richard Serra, Robert Ryman and Robert Smithson. “We got really interested in the process of these artists,” said McCollough backstage after the show. “They were more interested in this than the actual outcome because the process informed the outcome. We were playing with this idea of control and release – so controlling it by knotting and lacing everything in and then releasing it through slashing and forming baggier and slouchier silhouettes.” The lacing-up detailing that ran down jackets, coats and inserted into shoulder and body slashes, felt like contemporary corsetry, freeing and restricting the body both at once. If it was these artists’ methodology that primarily inspired McCollough and Hernandez, then their nature-derived and vaguely elemental colour palette dominated the collection in tones of grey, pale yellow, and monochrome. 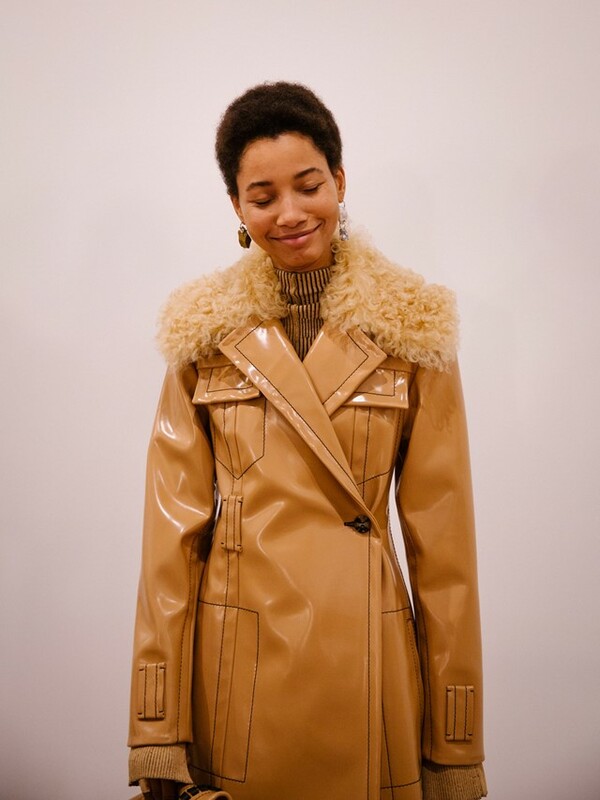 Eschewing loud colours, instead they played up the contrast in fabrics, as seen in the patchworked raw-edged rabbit fur coats sitting side by side with the synthetic and industrial looking cire with rough shearling collars. 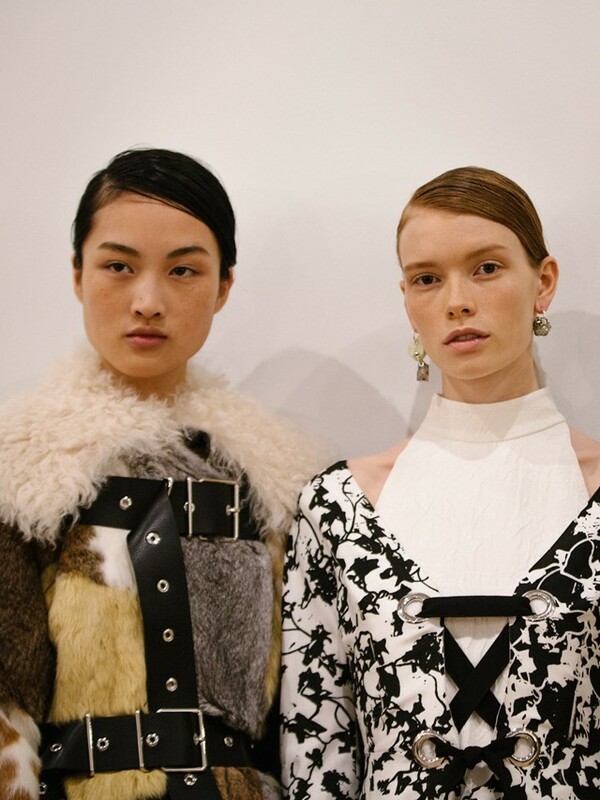 Proenza Schouler are yet another brand testing out the see-now-buy-now strategy as they are currently selling seven pieces as part of their Early Edition release online and in their SoHo New York store – so it makes sense that they should send out pieces that feel recognisably signature. And so the slashed body-fitting dresses from their last autumn/winter collection re-appeared in a patchworked viscose melange, echoing textures of Ryman’s built-up layers of paint. The use of the word ‘Editions’ in their straight-to-consumer offering feels particularly appropriate for Proenza Schouler’s art-led design practise.